Ali is our 4 yr. old female lab mix who was rescued at 4 months and very, VERY bonded twin to brother Taz. She is a very important member of our family. She is our 3 yr. old, nonverbal autistic son’s emotional support pet, too. She is very protective of him and early on claimed him as her very own human when we adopted him and brought him home from the hospital. He is the light of our life and she sensed he needed her to be his support and protector. We see why now! We truly believe she knew he was different so she gravitated to him, and he to her. He is the only person who can touch her ears, rub her snout, and lay his head on her uninvited. She has always been skittish but never to him! She somehow tore a major ligament in her knee. We can only guess that she was rough housing with her brother or jumped up (trying to get the squirrel that terrorizes them running on the power line all day) and landed on it wrong. The surgery was quoted to be at least $2800. We had been saving every extra dime and dollar since October even saving during Christmas! And we were so close to having it all. Then my husband went for a routine neck surgery and woke up paralyzed on the left side. Insurance covered very few pieces of medical equipment. He spent a month in intensive inpatient rehab. Between the medical equipment not covered by insurance, the copays for the few that are covered, over $700 in copays each month for therapies, and our portion (nearly 200k) for the surgery and hospital stay, we not only drained our account but now live paycheck to paycheck. Our son also aged out of early intervention through the education system so we now cover all of his therapies such as PT/OT/Speech/Feeding/ABA. For both my boys we drive an hour away for the closest therapies every day. We are responsible adults who just hit a rough patch in life. We are a middle class family that makes too much for government assistance and just enough to now comfortably without debt, until now. Now we live paycheck to paycheck. Before my son aged out and my husband became paralyzed, we lived comfortably and responsibly. Because of my husband’s life altering event and my son’s changes in coverage, we suddenly are struggling. We had done fine paying for my son’s therapies. We just did not dream a routine surgery would go so horribly wrong. We cannot qualify for animal insurance. I truly had no idea it existed at first. When I learned of it and applied we got denied twice due to the dogs being nearly four, Ali’s knee, and possibly having genetic issues later in life due to their breed. That is what they told us. At the time we were not worried because we were already saving for Ali’s surgery and were just going to continue to save after for emergencies with the animals. But there literally is not much left we can save, if any. Many specialists we have to see for our son are four hours away in Dallas, Tx. We also live in a small town. I used to work until my son was diagnosed. The nearest day care that takes special needs is 60 miles away and has a 4 year wait list so no help there. Plus he has thrived since I stayed home because we work on and go to one or more therapies daily! My husband has gone back to work to keep us afloat (he works from home for now for the VA helping Veterans get their benefits filed correctly for faster approval). He is a vet as well and loves to help his fellow military get what is owed to them. It is his passion and allows him to do desk work one handed. So we ARE trying. This is our last option or else Ali will have to wait for more than a year for us to save up this time. And she is already developing back and hip pain from not using her leg, not to mention it is just painful to begin with. We were told it would eventually cause nerve pain that would diminish her quality of life. If that happens they would recommend euthanasia and I just cannot imagine that with her beautiful spirit and playful life. It is breaking my heart more and more. 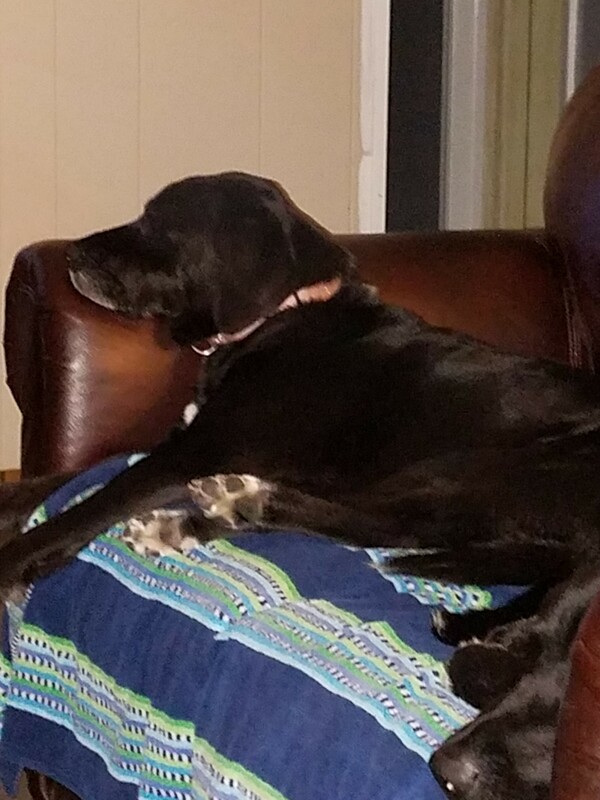 We are managing with pain meds, anti-inflammatories and as much rest as a bird dog will do (she has a lot of pointer in her too)! But the anti-inflammatories, which work the best, upset her stomach and she will quit eating when it gets to be too much, so we have to stop them until she recovers which leads to a vicious circle of pain, management, sickness, stopping meds, more pain, over and over. Ali is such an important part of our family and we worked so hard to have her surgery saved up. It was devastating to have to use the money we had refused to touch on our family. We had put it above everything and either went without or fixed our self the things that would have been used with it. My husband literally sobbed when he found out our insurance covered almost nothing in medical equipment (just his walker and part of his neck brace). He felt as if he was letting Ali down. But he could not go home without it. And our bills with the hospital, after insurance, is already over 100k. We have not even gotten the rehab facility bill. So what could we do? We have never asked anyone for money. We have always believed you either did without or saved up and for it later. The only credit we ever used was for our home, car, and the private adoption when we suddenly found out a friend had a grandchild due that needed adopting. So we have managed our money well. We just hit a rough patch. But Ali is the one who suffers and I don’t know what else to do. So we thank you in advance for any and all help. We will gratefully donate back as soon as we get back on our feet. We truly believe in giving back. And our son would get his Ali back whole and healthy.